Discussion in terms of stable folding. What is the role of secondary and tertiary structure? A discussion of thermodynamic stability and entropy-driven folding due to the hydrophobic effect. 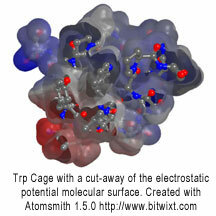 Why is the Trpcage motif so effective in inducing folding? Specific residues which are important. Based on homology search for this motif in larger proteins--Evolution, conservation, function. GLP-I receptor site and control of diabetes. Exendin-4 (Gila Monster Lizard Saliva) and Glucagon-Like-Peptide I (GLP-I) as drugs for diabetes. Model binding to the GLP-1 receptor using a ‘homologous” receptor crystal structure, such as Methuselah, a G membrane protein-coupled receptor [GPCR]? Does it work? Do other homologous receptors exist? Do they work? Compare binding of Exendin-4, GLP-1, and a “truncated” Exendin-4 (Trp Cage).